Telling you how difficult it'll be to find parking isn't all Google Maps is up to these days: The navigation app is rolling out an update on Android that should make getting around easier than ever. It all starts with a swipe up from the bottom of the Maps home screen. This will pull up three tabs - places, driving and transit - that each provide their own set of critical details about your trip, much of it in real-time. The most notable of the trio is the driving tab - open it up, and you'll see an estimated time of arrival to home or work based on actual driving conditions. The tab also delivers a traffic report for the area and expected delays along your route, helping you plan your drive or give yourself extra time to get where you're going. To see the real-time ETAs, you'll need your home and work addresses saved in Maps, which you can add by heading to Your Places in the side menu. The latest Google Maps update also brings a new transit tab that recommends which bus or train to take home or to work, plus when the next one arrives and an ETA for your route. If you're not headed home or to the office, you can swipe down to find a more nearby transit stations, complete with real-time schedules. Finally, the places tab houses what Google says are curated lists of places to fuel yourself up and imbibe under categories like "best dinners", "cheap eats" and "business dining." These lists will name spots near you, or in the area where you're headed. You can also search for everyday locales like ATMs, gas stations and grocery stores. The places tab also includes pictures and descriptions of the neighborhood to help familiarize you with the area. Google Maps has gotten increasingly more intelligent in recent months, going far beyond turn-by-turn directions. 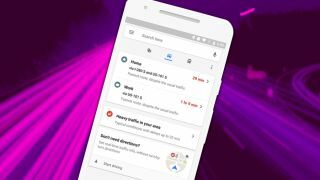 As Google Maps looks to stay up to speed with Apple Maps and even Waze (which Google owns), this is yet move in the right direction.